Buying a fence can be stressful. Not being educated about the ‘ins and outs’ of the fence buying and installation process can be overwhelming. We have created this guide to help you get started and to learn a little more about having a new fence installed. If you have a question you don’t see answered here or in our FAQ section, feel free to CONTACT US and we will be happy to answer any questions you have. Will they call the utility company to stake out buried lines? A reputable fence company will call Service Alert USA to make sure all utility (gas, electric, water, etc.) lines are clear of your desired fence location. This is required by law. How far apart are the posts set from each other? Generally, posts are set 7’6” to 7’10” apart for wood and 8’ apart for iron. 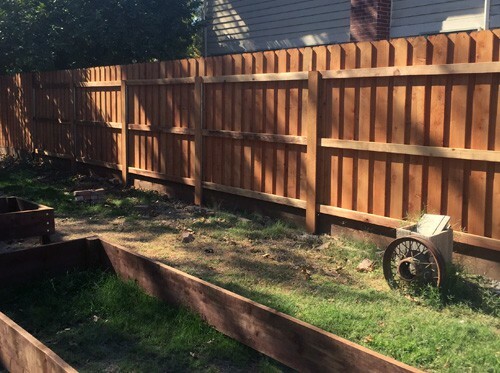 Are fence companies responsible for sprinkler heads? Homeowners are usually responsible for marking or pointing out sprinkler heads and underground sprinkler lines, this will help ensure there is no damage to your irrigation system. Check with your fence company to be sure. Invite fence contractors to look at the job and ask for an estimate in writing. In the quote also ask them to specify the time it will take to complete the job. Ask what their backlog looks like, and find out how soon can they start and how long will it take to complete. You will want to make sure all the contractors are quoting on the same specifications – linear feet, similar materials, posts, wood, gates, etc. What are the requirements if I own a swimming pool? If you own a swimming pool, there are special legal requirements that you will need to be aware of. These rules are designed to protect small children and save lives. A great resource to find requirements for your area can be found on your city’s website in the permits and inspections area. Execute a contract specifying the work to be done, total cost and payment schedule. Confirm that the contract includes all labor and material. If you live in a hard dig area, make sure any special costs for that are included in the contract. Lastly, be sure the contract specifies that the fence company is responsible for cleanup and the removal of your old fence. How deep do you set your posts? Posts should be set 2+ feet deep. Fence posts should always be set in concrete. In certain cases, engineering may be required. Most areas only allow a 6 foot fence and may require a permit for a higher fence. For taller fences, the posts should be set deeper for stability. There are some qualifications that can set a professional fence company apart. Be sure that the prospective fence company you are considering is fully insured, having both workers’ compensation and liability insurance. Your selected contractor should be able to provide you with a copy of his or her insurance policy. Make sure your fence company has a current contractors license. Licenses can be verified through the California State License Board.